Anubis ... the stud ... a line that was first developed by us back in Ontario as I'll explain. It is the product of 3 exceptional Danes from New Zealand, Africa and France. The owner of his stud didn't know all that untill we did our homework, thanks to the Internet search tool. When we traced Anubis' line, we didn't know at the time that Ch. Helisan Matahari's sire was sired by my Dane Lt. Columbo. That was back in Ontario and the produced pup that became the American sire - which I was going to keep and I named him after a member of our family (see the attached link) - was bred to several dams and established a Texas & Mississippi line! It's beyond coincidental or luck, it's the irony of fate that we got Anubis. It was such a surprise to find out. 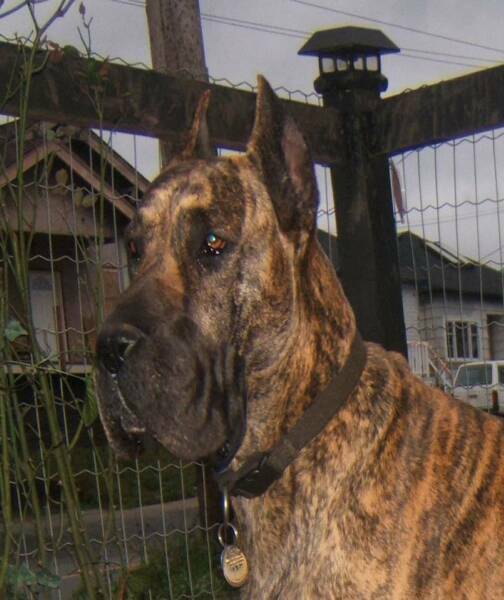 The founding sire which I had obtained from a French- New Zealand cross-line produced 3 other pups that established famous Great Dane lines from his pups that were sold for breeding in New York, Ontario and Brazil. How about that! Anubis is still a young, healthy, youthful active Dane at age 11 years. Nifirtiti "Nifi", Again, the Internet search and Kennel records show a Dutch - Danish line imported to Ohio. She is only 10 years old. Egypt. She is still almost a pup at age just over 8 years old. 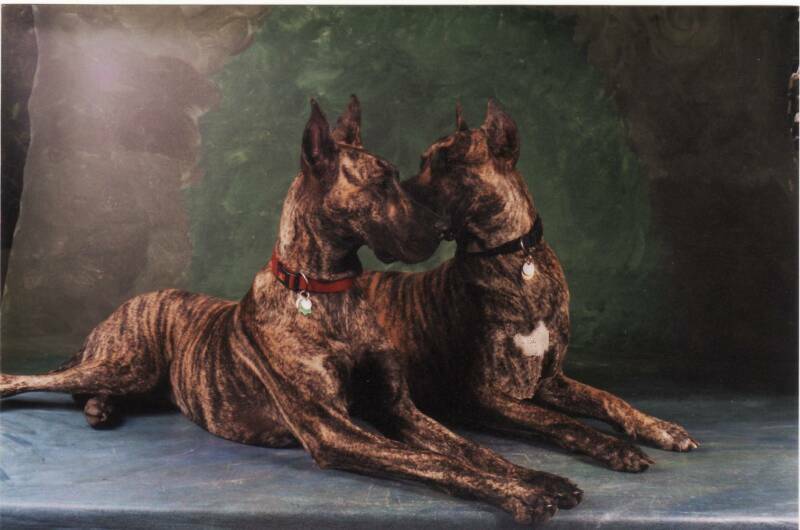 Anubis' roots go back to two great champions, an African Champion Dane that was brought to New Zealand, crossed with a French Dane from an African background and the Sire Lt. Columbo II, a pup I had in Ontario which produced Ch. Matahari that was sent to Texas, and Alexander The Great that was sent to New York. The French Dane Blateau's dam was from Hungry where good Danes have large heads with a bit of St. Bernard's image; big lips and a large head. 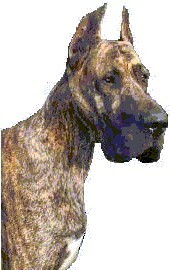 These Danes are the origin of such kennels as the indicated very few Hungarian, Russian, Polish and French top breeds. Anubis was imported to Canada at age 6 months. The breeder assured me he is the best pup they were ever blessed with in years of breeding, having acquired the best genetic characteristics from his great background top Danes. They planned to be keep him for breeding in Texas and Mississippi. I talked them into selling him on a co-ownership contract and with the agreement that they will get one of his offspring to replace him when sole ownership is complete and If I am to sell his pups for breeding purpose. His pedigree shows an impressive background of top quality champion studs and dams, and our use of Optimum Green Laboratories supplementary diet formulas are the reason why our Danes have such long and healthy lives and we know, again, he'll live to be twice the average age of his parents and his own brothers & sisters at his former breeder. He has the Lovely Dane personality, a great head, lips, chest, temperament and size (50 inches chest size, 36.5 tall at the shoulders, and 191 lb of Dane fun). The great grand-father in Ontario was a famous stud known for his TV commercial and the caption "ahead above the rest" ... and his sire and dam are again the two famous American champions, Ch. VKMs Antonio "Tony" and Ch. VKMs Cache at Alpine .... the top North American Danes for years. You'll be able to view all that when you enter Anubis' pages. To my disappointment, not jus the cheap pups, but also most of $1500+ pups' places were puppy mills, with dozens of pups in small cages, and they were by no means good (let alone great). In fact, some seemed like a cross with a hound, a boxer, a rhodesian ridgeback or God knows what!! One breeder had a picture of a good Dane advertised online and when I asked to see him, she said she never claimed it was the sire, but he is a related Dane and he is not around!! clearly a scam! The advertised or displayed Dane is not even theirs!!!! 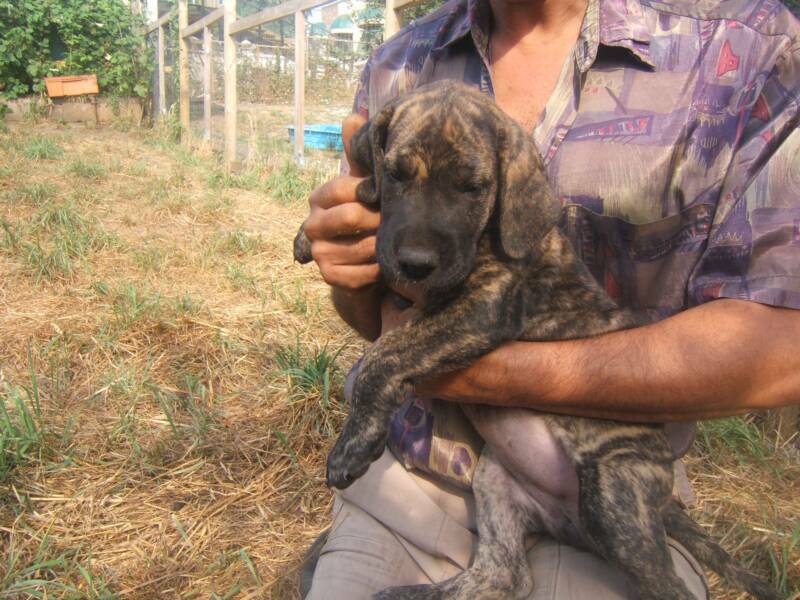 Not to put down all American or Canadian online breeders of course, but - my search came up with only 2 good breeders with good Danes; only two ... and they charge $2500+ a pet pup on a co-ownership contract (and very few other good breeders in Egypt, Russia and Holland) . A couple others were good and I mean just that, good Danes, not GREAT Great Danes. The large majority of online pups are scams and terrible quality. I was contacted by many families who purchased American and Canadian pups online and were sadly disappointed - when it was too late, and the dog is already a loved member of the family. It is perhaps important to understand the basic concept of breeding to produce great pups. Any breeder may have one "good" pup every now and then - if there are "some" genetically great dogs in the pedigree. But, that good pup will not produce good pups if he is bred, as he is carrying "bad" or inferior genes. Thus if the breeding line has weak background points, there is a bigger risk, including health problems. Second, the same breeder who has 2 good looking Danes (carrying not-so-good genes), will produce many modest and even poor quality pups - with a few reasonable pups - and the occasional good pup perhaps once in several breedings. So, to get a great pup, you need more than two great parents and you need more than two great lines; you need to get the exceptional dog that inherited only the superior Dane genes, from 2 superior Danes who had the full superior Dane genes package (the good genes only) - and who again came from two selected perfect Danes. In other words, you need a pup from continued generation of selected perfect parents with selected perfect chain of specific and unrelated lines (not just the general breeder line). The grandparents may be great dogs, but if one of their pups wasn't perfect and is bred, that risk will be there. You need a direct and specific line of the lucky pups that collected only the good genes out of two exceptional parents and great grand-parents to create the pup's personal direct line - then you'd breed him/her to a similar (and non blood-related) perfect dog. Then, you must give the parents and the pup a very special supplementary care. Unfortunately there are people who think you could get two good Danes, let them mate, get a litter to nurse and sell them!!! Small and mid size breeds maybe. Not Danes, Massifs, Hounds, Saint Bernard, Newfoundland, Borzoi, leonberger, Shepherds, bulldogs, spaniels, Braque, broholmer, corso, cao, sheepdog, cursino, wolf, dalmatian, doberman, guatemalteco, terriers, kanni, saluki - any dog that's about 100 lbs or over, and 24 inches high at the shoulders or more. Only then the result will be a secured perfection. The probabilities of genetic formations are so great and the risk will be there if there are poor dogs in the background. If the negative or imperfect genes are persistently eliminated one breeding after the other by selecting that one pup only out of even several breedings by two great parents, and that process is repeated for each breeding / generation, the probability of imperfection is eliminated or reduced beyond concern, only then one can get to a point of producing a full or close to a full litter of show perfection. I must admit however that in my 25+ years of Dane experience I have seen many breeders make many simple mistakes. 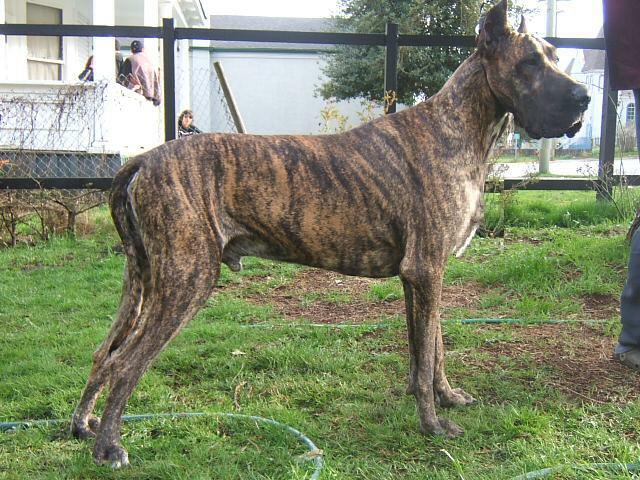 Recently, a breeder with a good male but the legs are stretched too far out; and a good female with legs stretched too far in, were bred, thinking she would then get Danes with perfectly shaped legs. Of course she got half the litter with legs stretched too far out and the other half stretched too far in!!! Carefully planned breeding is how the line can be improved and a breeder can produce better Danes than those produced by the breeder who produced the parents. Improving the breed confirmation and securing it is what breeding is all about and we have proven it in our displayed litter with what is now proven to be very well 100% show quality pups. It is no surprise that so far we had 6 inquiries from breeders who want a pup with full breeding rights. And it is sad that there are so many breeders out there who just breed for numbers. As I explained in Anubis page-2, I went through 2 years of search to get him. I dealt with several breeders some of whom asked for less than the apparent $1,500 average price while a few others wanted from US$2,800 to US$4,500 (that's well over CAN$5,500 after shipping & ears cropping) yet many of these over-priced pups were by no means great. Actually I found a few $7,000+ pups advertised online, clearly over-priced with business greed or to deceive the uneducated buyer who will assume that they must be the best. Actually, they were not the exceptional quality she believed and claimed! 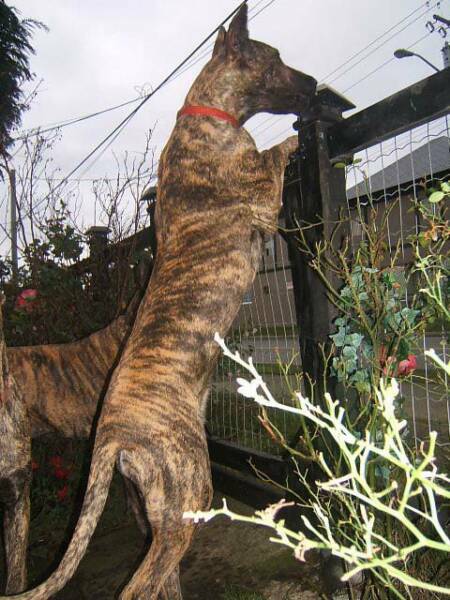 "Read how a $7000 pup breeder mentioned us as a quality reference in comparing her Danes to ours, see the link below". and Warda the fawn dam. Both dogs have traveled with Lord Basha and were bred in several Eastern European and North African countries. Top African Dane for 3 years. 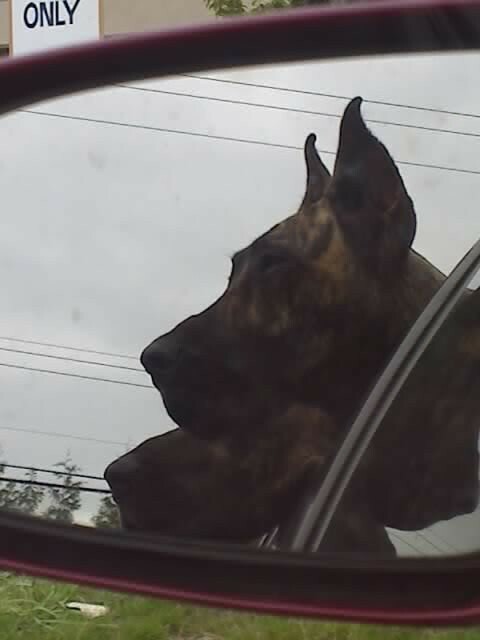 Danes love the car ride! Anubis, Nifi and Cleo are certainly no exception! Visit the photo album for a pictorial tour, which will also serve as a reference as to what the pups from previous breedings looked like. Our Danes are AKC-CKC-EAWS registered and they have repeatedly passed all health checks including: heart, hips, elbow, thyroid, skin, ears, teeth & eyes and are reported very healthy. For my own peace of mind, I went beyond the too early - too young minimal required tests, which are commonly done at 12 months and some at 24 months for the commercial record. Whether considering a pup now, later from any source, you must read the health related pages. Danes, Hounds and Masstifs (and all large breeds) should never be bred by just anyone. You'll read about related scientific facts and why the lucky and good homes who had a pup from us, and are committed to our health and development programme and supplements, I dared to offer them a life time health guarantee. And, our show pups have already made best in show and best in breed and obtained their CH titles in 3 countries. I'll later present you with the secret of Dane success that has been ignored by most people. It is no luck when a pup from a breeder whose Danes, including the parents and the litter of of brothers and sisters of that pup, never made it past age 6, yet the specially treated brother pup make 12+ healthy years. Finally, on the subject of our new Egyptian Dane, to the right, 3 ancient Egyptian dogs that are the origin of 3 contemporary dogs. 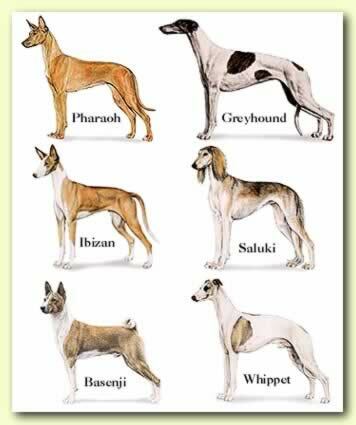 The Pharaoh is the origin of the greyhound which was crossed with the Mastiff to produce the most recent version now known as Great Dane. Notice the naturally pointed ears in all 3 breeds converted by man with cross-breeding into floppy ears. In fact, in nature, all wild dogs have pointed ears. Only breeds developed by man via cross breeding have floppy ears. A fact against those in favour of no-cropping, thinking they are sticking to the origin of nature. Below to the right, an actual Ancient Egyptian drawing that dates back some 5,000 years. The dog on the left looks just like a drawing you would think was drawn recently of a Great Dane. By-the-way, the Great Dane, no matter what it was called before over the centuries, had normally pointed ears and as I indicated, it was only recently when crossed with the Mastiff that the floppy large ears were produced. 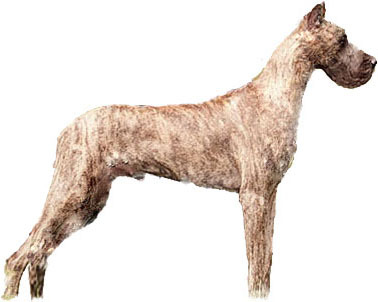 Note the "Dane" head, ears and body structure in this 5000 years old dog Egyptian drawing. Perhaps the most perfect female Dane I have ever seen in 25 years of Dane experience - and with the exception of Cleo and her Egyptian mom Warda, no other female Dane on any present site comes close. Nifi is an elite Dane with a long documented history. 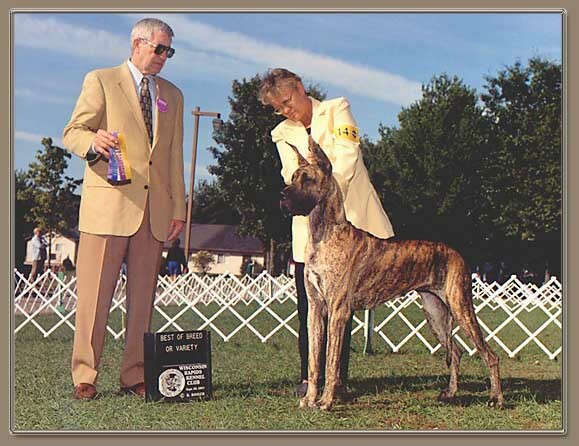 Nifi has a European bloodline - 8 French champions background; the last of which was imported to Ohio (click below to see her European - French Dane roots). Her father is a rare 200 Lbs and 38" tall sire with a Dutch line origin; and her mother's line is originally from Denmark, traced back to the famous "late" European Champion Dane "Vitsiki". We did our search carefully. 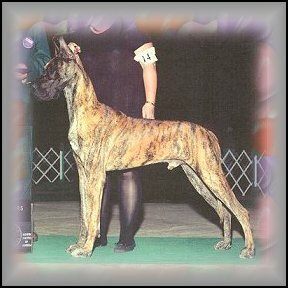 Her Dane line was brought to Ohio and the two best off-spring pups were taken to Alabama and California. As her direct breeder stated, she is the most exceptional pup produced by them in 5 years of breeding with the best genetic characteristics seen in her background top Danes. That's why they were going to keep her for themselves! She was described as a rare quality that places her in a breeding category by herself! Nifi is over 35 inches at the shoulders - with a long graceful neck & body structure; and is over 170 lb. Below, Anubis. It's fate that my search for a Dane ended with a line I claim credit for producing its root as I discovered. It took me years of search to get a Dane like Cleopatra. 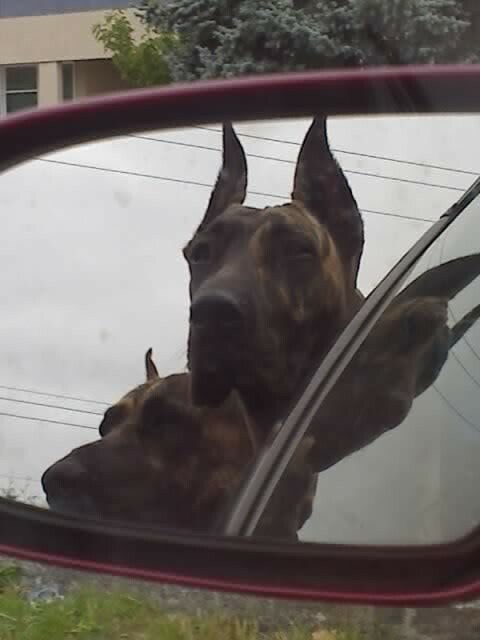 Even when I first got Anubis, I had absolutely no intention to breed Danes at the time. I just wanted to have a good Dane again. However, I decided why go through years of such hassle again!? I was frustrated with the arrogance, greed and "Bitchy" attitude of breeders and I decided, never again. So back to breeding I did. It's hard to find a good Dane. And after acquiring the exceptional Cleopatra and Nifi and seeing how they & Anubis developed beyond normal expectation - and I'll tell you later how and why - I accepted that everyone was right that I should breed my Danes and I realized why the breeder insisted on a clause whereby I must give them an off-spring pup. . I was lucky to allocate a female such as Cleopatra who displayed perfect genetic formation collected only from the best Danes in her background. After all, she was the result of a line featuring tours throughout Europe and Egypt involving the greatest of Danes. Our site was rated the best and the most informative breeder site in the world. Anubis is 191 lb and Nifi is 164 lb. They produce very large pups with show quality characteristics. Zia, Anubis & Cleopatra's daughter at age just 7 months. She was the best in show. photo fo her at age 7 months. Isis, Anubis & Nifi's daughter. Owned by Travis Riley Williams of Campbell River, B.C. at age 5 months. Travis has emailed me asking to pay the difference to switch her status to a show dog. This was the advice of a lady who saw the Dane with him and examined her. She is no ordinary person. She owned the #1 Dane in Canada 10 years ago and has had Danes and shown Danes all her life (she is not a breeder, just obtained a Dane from Russia). She described Isis as a top show Dane. I hope that Travis will show her - which involves a great deal of time, travel and expenses, but at the end, as he was advised, he will earn the pride and the bragging rights of having the number 1 Dane. Several of our pups have already made best in show in several countries. Surely size isn't every thing and it isn't enough feature alone. 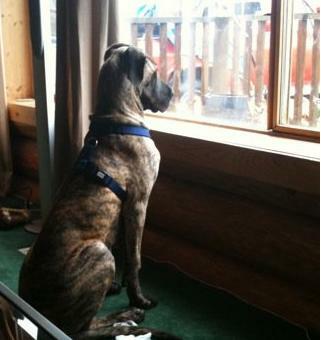 However, it just isn't a GREAT Dane without the Great size as well as the great characteristics. Anubis has a 50 inch chest size. Anubis is a now a young almost 12 years-old pup in every sense. His health predicts an expected 18 years of enjoyable healthy life - thanks to O.G.L. unique large breeds supplementary corrective & preventative formulas. Check our health section. 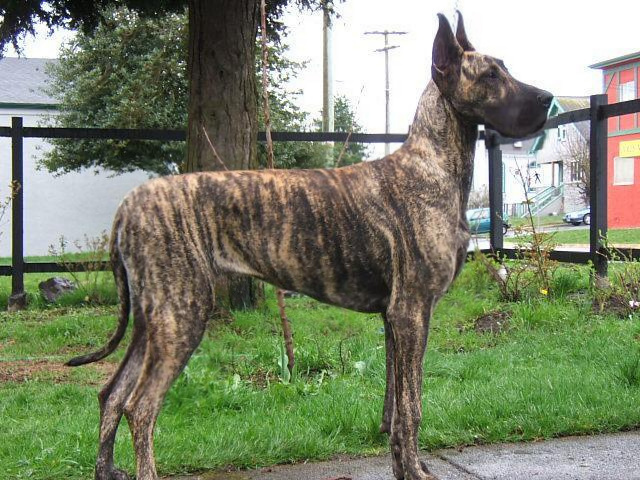 Anubis Great Danes are raised by a small two members family, the Goudas; the father (Paul Gouda) & his only begotten son (Pele`) residing in the beautiful British Columbia, Canada. We are not a Danes kennel, and I have never really been a "breeder." I had terrible experience with breeders and I hate commercial breeders. We are a Danes family. I bred mainly for friends & family and only when we had confirmed and pre-approved 4+ quality homes. And since we always give away at least a couple more free pups to friends and family members, we thus secured good homes for at least most of the litter before I bred. Though we only bred a total of 3 litters, we never had more than two pups available per litter after birth, if any. And, having already met the intent of my breedings, this (March 2012) is my last and final breeding, at least for a while. Unfortunately I found that most homes don't follow the diet & supplements instructions. If you have a large dog, please visit the health section and the supplements page. And this site, well, I created it with a solid goal in mind, to provide Dane lovers (and breeders of large breeds in general) with a complete reference, an educational library, and to offer a corrective and developmental tool. This site is the production of many hours of late night chat-type material I entered over a glass of wine. I have to warn you: short & sweet is not one of my qualities! You'll find a lot of information that would help any Dane (and other large breed) owner; but you'll also find a lot of lengthy chat & boasting. Well, we love Danes and we're proud of ours! So, set back, relax with a cup of tea, coffee or a glass of wine and get ready for a long reading session. And remember: this site was twice voted by EWAS and Dogs Magazine the best breeder site & the most informative dog site. You must visit our library. You could also tour the site efficiently via the index banner at the bottom of the page. 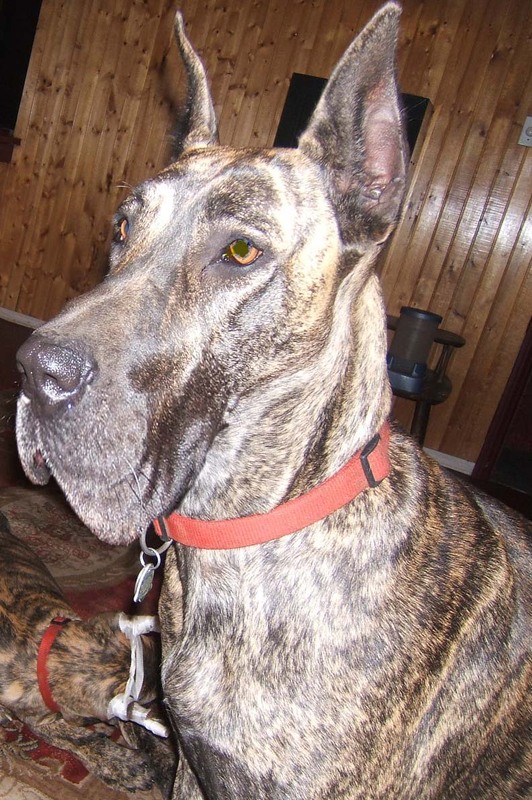 Though I know many will not listen, many did not listen and they just had to learn the hard way, if you are planning on a Great Dane, STOP ... read the information here. PLEASE don't assume it's driven by commercial motive BS. As I said, I have no pups to sell you and no plans to breed any time soon! 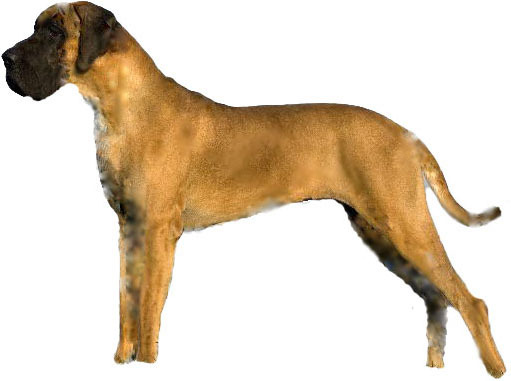 Danes, Hounds & Mastiffs - generally large breeds, are in a different category. I get an email perhaps every week with horror experience from people who bought a pup from one of the dozens of uneducated breeders out-there, and soon were faced with the ugly reality that not all Danes are created equal. There are many breeders who just mate a male with a female and sell pups. Two new breeders just started right here in town. Most stories I get talk about expensive health problems as early as age 2 or 3 and even death as early as age 4 or 5. Read all the pages in the breeding section and the puppy section before you get a pup from any source. Danes are our hobby and passion. I have had Great Danes all my life and I claim, there are no other dogs. Indeed there is nothing like a Dane - and my best reward, when I bred, was making many friends and families happy. I am maintaining this site as an educational service. Nifi, is shown here as a pup at age 1 year. She is now a young lady at age just 10 years old; and as playful and active as she was at age 1.
. Get a copy. Click here. Our latest book. 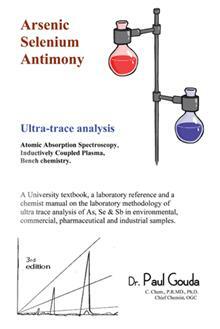 As, Se, Sb ultra-trace chemical analysis. A university textbook, a chemist reference and a laboratory manual. The right supplements to aid growth and development will lead the dog to its optimum physical potentials, beyond what the rest of his own litter and his parents have reached. Stay in touch. our Bulletin board.